About Us | Why Choose Bernhard’s Sports Surfaces? 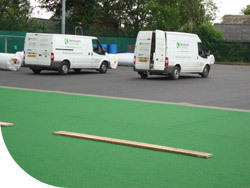 Bernhard's Sports Surfaces have been at the forefront of the synthetic sports surfaces industry for many years. Being industry leaders has allowed us to keep abreast of any changes that have taken place during the last few decades and adapt our services accordingly. This has meant that our synthetic pitches, athletics tracks and natural pitches are always developed in line with performance and sports technology, making them the best available. We understand that these projects require careful planning and development and are often tied to significant investment. Their complexity determines that they should be undertaken by a professional sports surfaces company, therefore ensuring the utmost satisfaction of our clients. We are extremely serious about the high standards needed for your sports facility, and we always deliver the very best facilities to our clients. As a result, we've developed a 5 Step Plan to help us provide you with the facility you deserve. We will submit a detailed costing analysis complete with anticipated schedule for construction, future maintenance and support requirements. 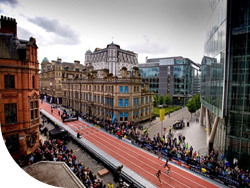 We can then construct an inspiring sporting facility that is ready for extensive usage! We're committed to using the best materials to create your pitch, track or multi-use area, and we use our expertise to provide you with a facility that will continue to enhance the performance of its users whenever they step onto it. It is this commitment that has left a lasting impression on our many satisfied clients. We guarantee that the sports surface you purchase from us will continue to impress time after time and as a reflection of our commitment to quality, we can offer an inclusive ten year warranty. 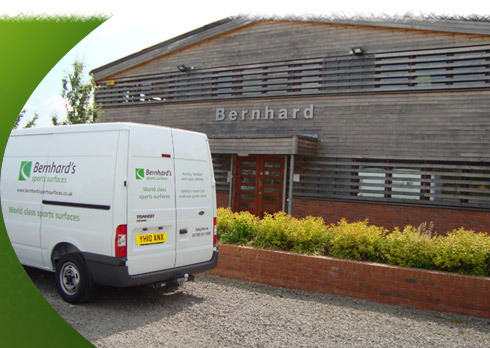 By choosing Bernhard's Sports Surfaces for your sporting requirements, you receive a superior standard facility, installed by a highly experienced, competent workforce, all operating under a name you can trust.